Non-compatibility with older devices – Let’s just face it – iOS 9 does not really work that well on either the iPhone 4S or the iPad 2 (both of which are almost 5 years old now). Software and iOS app development experts fully expect these two ‘old’ handsets to be not included in the line of iDevices to receive the iOS 10 update. Apart from the fact that the new platform will not provide optimal performance on the older devices, there is also the factor of more RAM space required for iOS 10 (extra 512MB). The update will be compatible with iPhone 5 and later handsets (including iPhone SE), and on iPad Mini 2, iPad Air 2, and both the iPad Pro-s (9.7” and 12.9”). Note: There is a cloud of doubt on whether iOS 10 will be available on the original iPad Mini. More personalization options in Control Center – Apple has started providing greater customization options in its recent iOS versions – but Android still offers much more flexibility in this regard. In the upcoming iOS 10 platform, the Cupertino company has the opportunity to integrate 3D Touch within the Control Center of iPhone 7 (the new handset on which iOS 10 will debut), as well as allow users to move the existing buttons and widgets. An improved, more customized Control Center would make the upgraded iPhones a lot more easily usable. Viewability of the status of contacts – iOS 10 is likely to let users see the status of their friends (whether they are available or away from the phone, as well as the mode their handsets are on), right from the Contact List. Mobile app developers got the first look of this feature from a recent iOS 10 patent, and they expect this feature to be optional, and available for both parties. In a nutshell, the Contacts app of the updated iPhones will become more informative. Removable stock apps – Many of the first-party Apple stock iPhone apps are hardly ever used by people (the Tips app, for instance) – but they just remain there, unmovable, and eating up the space that could easily have been taken by more useful third-party applications. It would be just great if Apple gave us the option to delete (or at least, hide) some of the unused stock apps, so that other applications can be downloaded easily – without cluttering up the device. Arrival of the Dark Mode – Apple introduced Dark Mode with OS X 10.10 Yosemite, and general users as well as professionals from the field of iPhone app development feel that it’s high time the feature was introduced in the iOS ecosystem too. Apple has already added a new ‘Night Shift’ feature (which changes the screen color pallette to warmer hues at night) in iOS 9.3 – which is an indication that a full-blown Dark Mode might indeed be arriving with iOS 10. One of the more likely features on this wishlist. Option to provide app previews – All the iOS app developers out there would simply love this option (if Apple decides to provide it). New apps can then have a preview option, with constraints/limits on either the time or the app-content. That way, people will be able to easily check out the features of the app without incurring expenses, while developers would no longer have to live with a ‘lite’ AND a ‘full’ version of their applications. There should be an upper threshold – which, when crossed, will cause the app preview to expire. Multi-user feature for iPads – Apple introduced split-screen multitasking with iOS 9 for its iPad series – and the feature has found appreciation from all quarters. iOS 9.3 brought with it yet another new feature – multi-student log-in. It would not be unreasonable to expect that multi-user support will be available on devices upgraded to iOS 10. It would be particularly useful on the iPad Pro, which is, in essence, the most ‘personal’ iPad model out there at present. More useful Siri in iCloud Voicemail – This has been in the news since 2014, when Apple started testing iCloud Voicemail. Chances are high that Craig Federighi and his team will showcase it for the first time at the Apple WWDC 2016. In iCloud Voicemail, Siri would be given the responsibility of recording voicemails, and it will also be able to inform callers why someone is not being able to receive a call at any time. What’s more – the mobile digital assistant for iPhones will have the capability to create transcriptions of voicemails as well. iCloud Voicemail, if launched, would take up the user-convenience factor by a couple of notches. ‘Rootless’ security – An all-new security setup for iOS, called ‘Rootless’, is in the works – and there is a possibility that the system will be integrated with the iOS 10 platform. It will probably plug the holes at the fundamental levels of the platform, rendering the task of doing iOS jailbreak next to impossible (a bad news for jailbreakers!). However, provided that Apple indeed makes the upcoming version of its mobile platform more customized – less people will need to do a jailbreak…and the tighter security will have other benefits too. A makeover for iMessage – Make no mistake – iMessage is a very handy tool for iPhone-owners to communicate with others. The only bone of contention with it is that – there has hardly been any changes made to iMessage over the years. With iOS 10, Apple can throw in a couple of new things in the mix – like the option of adding in-line animated gif-s (from plugged in external apps) and replying to messages with emojis. iMessage with richer conversations – now, who would not like that? More choice of wallpapers – Seven dynamic, nine animated and twenty-seven still wallpapers – that’s all Apple currently offers users in the way of iPhone wallpapers. Over the last few years, additions to the wallpaper range have been much lower than the number removed from stock. The limited availability of wallpapers has forced many users to either download third-party apps or browse the internet, for newer wallpapers. iOS 10 can, and should, pack with it a collection of new, vibrant, engaging wallpapers – to keep things interesting and convenient. After all, everyone likes a ‘good-looking iPhone’! HomeKit support – Another long-awaited and much-anticipated feature that has the chance to be present in iOS 10. Just like HealthKit was announced in WWDC 2014, this year’s annual developer conference would be the ideal stage for releasing HomeKit on iOS 10. Many third-party mobile app developers have already started making applications with HomeKit compatibility – and it would make sense for Apple to add the ‘Home’ app in the display of upgraded handsets. HomeKit would arrange devices in separate ‘virtual rooms’, and the control options would depend on the actual physical location of users. A rejig of the Apple App Store – Not the likeliest to happen, but it’s worth mentioning this one on the list. End-users as well as developers feel that it would be a smart move to have a separate section for ‘freemium’ applications (aside from the ‘free’ and the ‘paid’ apps). Also, with a high percentage of people searching for apps only from the ‘Top’ and the ‘Featured’ lists in iTunes, the ‘Explore’ tab is not exactly very useful. Removing it will, if anything, make searching for apps even easier. Fixes for orientation and memory cache problems – Although the iPhone 6S Plus is an excellent device, there is a common complaint about it from users – that whenever they ‘wake up’ the phablet, its orientation changes way too easily to the landscape mode (this, according to app testers, does not happen in iPhone 6 or iPhone 6S). In addition, there are certain cache bugs in iOS 9 – which cause apps, when minimised, to automatically reset. Apple developers, in all likelihood, will iron out these flaws in iOS 10. Although not very likely, the ‘Complications’ feature of Apple Watch can make a welcome arrival in iOS 10. Better volume controls for media apps (say, YouTube) and a more customizable snooze option in the iPhone alarm clock would be handy. It’s time some of the more-frequently-used stock iPhone apps – like Photos and Calendar – got new features as well, while Apple Maps should finally have the Street View option in iOS 10 (Android has already ‘been there, done that’). Multiple Apple IDs of developers should be merged into one. 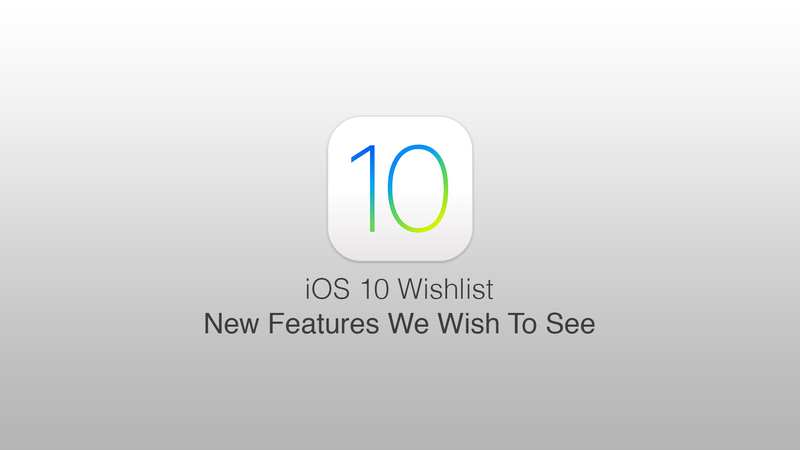 It will be fascinating to see how many of these ‘wishes’ are actually fulfilled when iOS 10 is demoed at WWDC 2016. One thing’s for sure though – all eyes will be on the proceedings at Bill Graham Civic Auditorium on the 13th of June!